After Adding Mi Calculator App To Google Play Store, Xiaomi Released A New File Manager App On Play Store Called “Mi File Explorer”. There Are A Lot Of File Manager Apps Available In Google Play Store Already. Mi File Explorer App Is The New One Which Is Going To Add In This List. Xiaomi Already Launched Mi Calculator App Recently On Android For All Devices, And App Cross 10 Milion Mark In A Little Span Of Time. Now, It Seems Xiaomi Is Bringing More Apps To Google Play Store For All Android Devices. 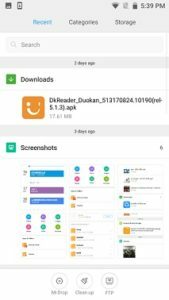 Mi File Explorer Just Appears On Google Play Store In Unreleased(Beta) Program. This Xiaomi File Manager Comes With A Lot Of Features Including All Which Offers By Other File Managers Too. Mi File Explorer Comes With Three Section Look-Recent, Categories And Storage. In Recent Section, You Will See Items Like Recent Downloads, Screenshots, Downloaded Images Etc. In Categories Section, Files Will Sort By Formats Like APK, Music, Videos Etc. In Storage Section, You Will See Disk Usage. This File Manager Comes With Built-In Cleaner Which Helps You To Clear Junk Files And Cache. However, I Do This Manually From Android Settings. Xiaomi’s Mi File Explorer Comes With Mi Drop Feature Which Lets You Share Files To Others Who Are Near By Without Internet. With This Mi Explorer Feature, You Can Remotely View Or Manage Your Files From A Remote Computer. You Can Do A Quick Search For Your Files Instead Of Manually Checking Each Folder Of Your Disk. With Mi File Explorer Feature, You Can Decompress ZIP(Compressed) Files With One Tap, You Can Open Videos, Music, Documents, APKs. You Can Download Mi File Explorer From Here(APK Mirror) Or Directly From Google Play Store. Mi File Explorer Supports Other Android Devices Also Including Xiaomi.